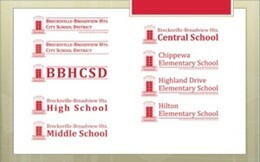 The Brecksville-Broadview Heights City School District’s Brand Identity is one of our most valuable assets. It includes our name, brand signature, brandmark (logo), and graphic presentation. 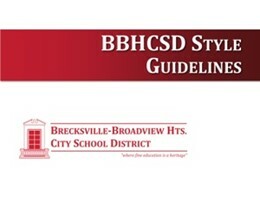 These elements have been designed to be a clear representation of BBHCSD, and when used consistently, will help to project a clear image of BBHCSD wherever they are seen. We greatly appreciate your efforts to implement these guidelines in your classroom and presentations. A well-executed branding initiative should make everyone’s life easier. Not only will it help designers ensure that their work will be approved and accepted faster, but it will allow BBHCSD’s employees to have a myriad of design tools and collateral materials at their fingertips, all possessing a uniform look and feel. The BBHCSD Vendor kit contains valuable tools for both the BBHCSD team, and for their third-party vendors. In addition to all the logo files, the Vendor Toolkit also includes the BBHCSD letterhead and various Microsoft PowerPoint Presentation templates. The iconic window logo used in our collateral is an artist’s rendering of an actual window in the current Brecksville-Broadview Hts. Central School. At the time, that building served as the district’s High School.